INSPECT THIS EXTINGUISHER CAREFULLY BEFORE SIGNING REINSPECTION RECORD. HELP PREVENT FIRE. REINSPECTION RECORD. DATE___. BY___. DATE___. BY___. RECHARGE RECORD DATE___. BY___. DATE___. BY___. 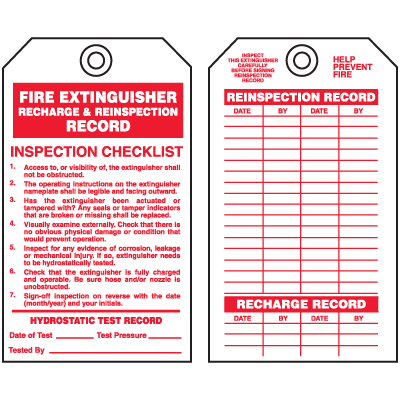 FIRE EXINGUISHER RECHARGE & REINSPECTION RECORD INSPECTION CHECKLIST. 1. Access to, or visibility of, the extinguisher shall not be obscured. 2. The operating instructions on the extinguisher nameplate shall be legible and facing outward. 3. Has the entinguisher been actuated or tampered with? Any seals or tamper indicators that are broken or missing shall be replaced. 4. Visually examine externally. Check that there is so obvious physical damage or condition that would prevent operation. 5. Inspect for any evidence of corrosion, leakage or mechanical injury. If so, extinguisher needs to be hydrostatically tested. 6. Check that the extinguisher is fully charged and operable. Be sure hoseand/or nozzle is unobstructed. 7. Sign-off inspection on reverse with the date (month/year) and your initials. HYDROSTATIC TEST RECORD. Date of Test____. Test Pressure_____. Tested By____.